From goth clubs to reggae beaches, music innovator Christopher 'Christo' Jackson, is passionate about one thing, new music. For over a decade the singer for 'impulsive lust' has been driven to create new sounds, new genres and excitement with something fresh and non-cliche. From that 'lust' a New style Reggae and Gothic Reggae were born. "Remember the first time you heard Bowie or Nirvana or Gaga and you thought 'sh*t this is amazing'...that's where my heart's at!" impulsive lust is that feeling in your blood when you're so alive, and going for what you want! 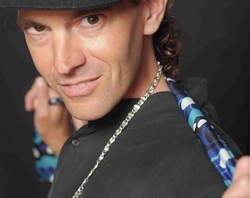 Christopher 'Christo' Jackson is the voice behind the music. "From years of "hitting record" every night and playing whatever I felt in my soul, it came to a point in '98 when I realized there was something going on, and the only way to get better was to do a song more than once. Songs just come to me, so in the early days I would just play and create, and come up with 5 to 10 new songs a night, but I'd never go back and work on any of them. I think the alcohol distorted everything, and I realized that music was priority over drinking, and that music was my way out." So from the first 2 song demo in '98, the songs kept coming and so have the demos, including 6 full cds and the "Best of" cd that make up the impulsive lust catalog. "Of all things that have helped me out the most, it's the ability to let go. Get away from myself and just let it happen." It all came together in a small Santa Monica studio apartment, and has continued to San Diego and back again to L.A.
"All people need to express themselves, and this music has been the ride for me. The idea behind it all has always been to create something new, something truly it's own sound. And with this sound, a positive, soul searching, joyful message sung straight from the heart. Let's all make a positive change in the world!" impulsive lust is a solo project created by Christopher 'Christo' Jackson in 1998. It originated in Santa Monica, CA. as a positive soundscape for the experimentation in innovative music. Mixing styles, bending genres, imagining and covering new territory is the 'lust' driving it forward.